If numerous tenants are in an office building, wayfinding signs and directional signs are needed for navigation. Most of these signs are made in a way that the information can be changed easily for when tenants move in or move out. 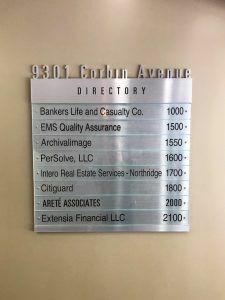 Arete Associate is an existing customer of ours who is a major tenant in an office building in Northridge, California. We have done many different sign jobs for them which include updating their tenant information on interior signs. Most recently, we updated a directory sign panel and a suite ID sign for the office building. A directory sign is a sign that is usually installed in the lobby area that lists all of the tenants in the building with their corresponding suite number. The purpose of directional signs is so people coming in can confirm that they’re in the correct building for the business they are looking for, and so they can navigate to the correct floor of where the business is located. As you can see from the photo, the directory sign has two parts to it. The section with the address and the word “DIRECTORY” is permanent, but the clear panels with the tenant information are removable. We plotted new vinyl for the tenant, Extensia, and applied it to the existing clear panel. The suite ID sign is made in a similar way, where the backer panel is permanent, but the section with the tenant information can be changed out easily. They actually needed a new backer panel, so we made a new one for suite 2100. This is a sibond panel with a brushed aluminum finish, and we use an engravable material called Rowmark for the portion with the engraved numbers. 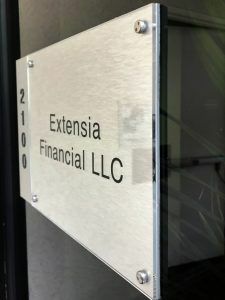 Now their interior signs are up to date, and employees and clients will be able to find Extensia Financial.